The world of Minecraft is made entirely of blocks. Some help you build, some help you stay alive. Every block you discover opens up new possibilities and exciting adventures. 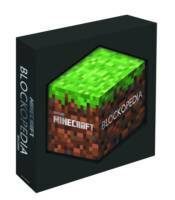 The Minecraft Blockopedia is fully illustrated and packed with essential information about each block and its uses. From basic plants and ores to enchantment tables and End stone, you'll find every single block in here. Blockopedia contains everything you need to know to make the most of the blocks that make up your world; it's a comprehensive reference tool for beginners and more experienced players alike. This hexagon-shaped hardcover book is presented in a stylish gift box, and a must for fans of any age. MINECRAFT PLUSH SLIME 9.5" WITH HANG TAG MINECRAFT PLUSH TUXEDO CAT 8"